Peace is defined as, “freedom from disturbance”. I’m not sure what to write on that topic because my life is never free from that, but here goes. The people I admire most are “peaceful”. In that I mean that they don’t stir up controversy, they don’t gossip, they don’t have time for negativity. It’s becoming more and more rare in the world we live in to find these types of people, but I promise, they do exist. I know a few. Recently a dear friend of mine went for a mammogram. Totally routine, she wasn’t concerned. Until her doctor called and said they found something. I was completely devastated for her. Her reply was that she of course was concerned, but had already set her heart and mind to trust the Lord. She was at peace with whatever the outcome was. And those aren’t only words, she really was a beautiful example of faith. She soon found out that the lump was cancer and had it removed along with testing of some tissue in her lymph nodes. Thankfully she had the mammogram (like we all should be doing ~ preaching to myself) and they found it early enough that she won’t have to undergo as much as some. I prayed for her of course, but what I took away from her experience (’cause I’m selfish that way sometimes) is that we have no control over the outcome of things. We can do all the right things and still have things like this smack us into reality. The only constant thing that we can control is our relationship with God. There is no way unless you live in the middle of a deserted island that you will ever find peace. It’s not happening. There will always be something or someone requiring you to step out of the quiet. But you can be at peace. At peace with what the Lord has planned for your life. My friend found it a blessing for this to happen because she really believes the Lord wanted her to cross someone’s path. Meet someone who needed to hear about her Jesus. Somewhere, someone needed to witness her strong faith and the peace that she felt knowing it was all in God’s hands. We can search our whole life for peace. We can chase it around. We can go to the quietest place. But if you’re not at peace, you will never know what peace really is. My friend inspired me to look to God for peace, not my circumstances. Every day brings its own struggles and noise, but what remains, no matter what, is God’s unwavering, unchanging love. “We can search our whole life for peace. We can chase it around. We can go to the quietest place. But if you’re not at peace, you will never know what peace really is.” So true. Thanks, Tina. Tina, this is so beautiful and spot on and convicting and true. Thank you for the reminder that perspective (and obvs a relationship with Jesus) is everything. I’ve no doubt God puts people like your friend in our lives to show His peace lived out in difficult circumstances. Great post, Tina. What comes to mind for me is peace within the chaos of every day life. We can choose peace. And depending on the day, we can be the peace that others need or they can be that peace for us. Thank you for this ontime message about peace. 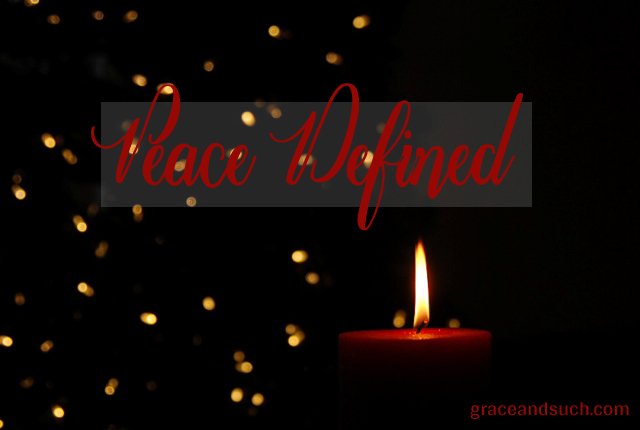 If we just hold to God’s unchanging hand, peace is a naturally possible occurrence. His peace the human mind can’t fathom. Your friend is peace in the flesh. My mom panicked when she was diagnosed and put off chemo for 6 months. Had she trusted the God she says she believed in, her outcome could have been much different. Thank you, thank you, thank you!